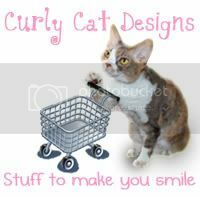 Daisy the Curly Cat: Meet Our New Buddies! Here I am meeting my brand new buddies for the first time. Can you guess what they are? Gerbils! Meet Bert and Ernie. They are just about 2 months old. They don't eat good foods, just nuts and grains and boring stuff like that. Oh and they like to chew on sticks. Ernie is more active than Bert. He is already running and running on his fancy wheel. Bert is black, but he has little white gloves and a white bib. I guess he is a tuxedo gerbil! He is a little bit friendlier so far, and already climbs into my Mommeh's palm. I think Ernie wants to be a circus gerbil! I like the puff at the end of his tail. Harley got to meet Bert and Ernie, too. Harley was only a little bit skerred. We are only allowed to watch Bert and Ernie inside the cage, on account of we might accidentally get too rough with them. Welcome to our family, Bert and Ernie! Wow... your own pet mice. That's so cool. They are cute. We can see you both find them very interesting. That's cool. I'm sure they will provide you with lots of amusement. I bet Harley would love to play with them--maybe even EAT them up! They sure look like mice to me. Oh how cute! Maybe yoor mommeh will get them a hamster ball thingy, so they can play wiv yoo safely? Under soopervision of course. Wow, your family has increased. They are too cute. What good entertainment for you and Harley. Can't wait to see if they will wear some costumes. Have a fun day. This is going to be very interesting. I love the stare down that Harley and Ernie are giving each other in the last picture. 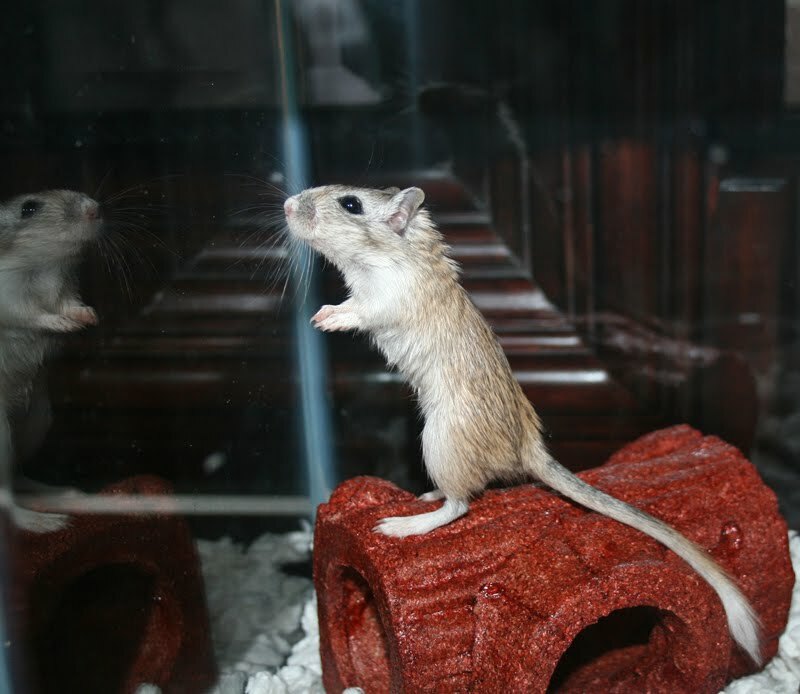 Those gerbils are going to be great pets! Our Mommy bought us a mousie in a cage, but we can't take her out and play with her. We like to sit on top of the cage and imagine! Then we have to go and play with our fake mousies. OMC! Hi Bert and Ernie! You two are so dang cute! What a great home you have. OMC! you iz SO lucky! If i had noo anipals like dat I wud be SO happy! i can tell you likes to watches they play but I wish you cud take em owt an play too! KEWL!! How exciting! Did you make sure to tell Bert and Ernie that you can't just appear on the blog without being hilarious? It'll help if they wear underpants hats. p.s. 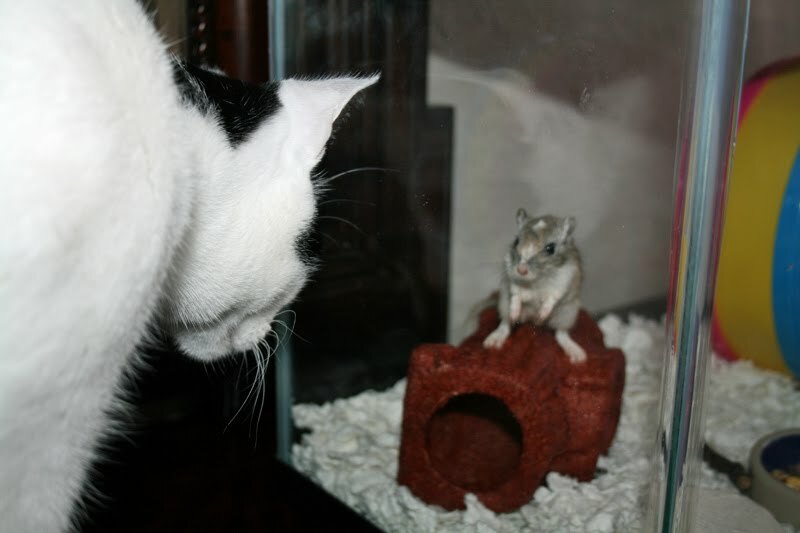 to Harley: Gerbils are not food. Stop looking at Ernie that way. Oooooh, they are very cute! I hope your Mommeh lets you sniff them and lets you know that Bert and Ernie are family members and there is NO eating family members! 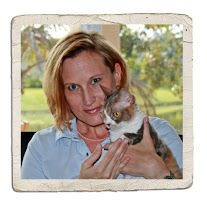 We used to have hamsters and none of our kitties ever bothered them--even when they escaped, which they all do at some time. Have fun with your new friends and tell them we said "hi"! oh they are soooo kyoooot! They would be nommed on in our house so no gerbils here. Your mom must have wanted more critters to take care of, haha. 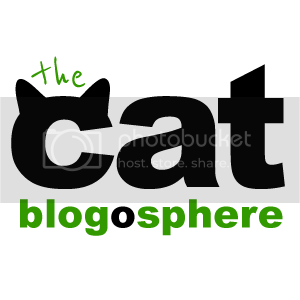 I can't wait cuz I know there will be new bloggy posts about these guys and you kittys. Hi Bert and Ernie! Nice to meet you! We know you'll have lots of fun with Daisy and Harley!! oh how cute, you are lucky kitties to have your own gerbils! What cute furry widdle brudders! I love gerbils!! They are sooo cute! Welcome to Bert and Ernie!!! 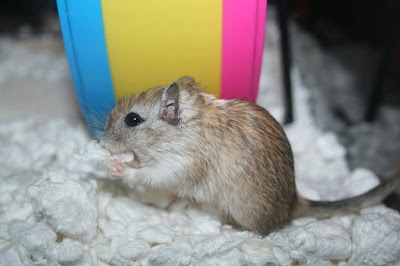 I had a Teddy Bear Hamster when I was in college and I just adored him! Hmmm...I think your Mom didn't let you play, not because you would be too rough but because you may EAT THEM FOR LUNCH!! lol!! What great entertainment Bert and Ernie are going to be! We hope you and Harley let us see a movie of them with your Mommehs' Flip! OMC! Breakfast and lunch! We'd be in a frenzy, trying to "play" with them if they were in our house! That is very cool - they look like fun to watch and hang out with :). as a housewarming gift I think you should buy ernie a rubber duckie. Oh wow. I want a pet too! I mean, are you the first kitties in the CB to get your own pets?? Ooh! I wondered yesterday if it might be gerbils. I've had both brown and black ones and they definitely differ in personality. They're so cute and lots of fun! Welcome Ernie and Bert! You and Harley are allowed your own pets - we want some pets now but mum said NO. She is a very mean mum. OH MY GOSH, MISS DAISY! I CAN'T BELIEVE IT! YOU'VE GOT A VERITABLE SMORGASBORD! YOUR VERY OWN DREAM COME TRUE! FOOD ON THE PAW! Of course, you're far too sophisticated, tenderhearted, and nice to even THINK of Bert and Ernie in those terms....aren't you? teehee, how did i knows Harley would be a little bit scaredy of the gerbilses! it is okay, Harley, they is way smaller than you. i keep trying to tell my mommeh i wants a pet but she is not listening, maybe you can talks her into it Daisy. the kittehs who Came'd Before hadded a pet mouse, named Herman. he would go in a ball and roll all around wif them. Wow, you got your own pet gerbils?? That is cool!! wow those look like nice sna- um friends new friends. 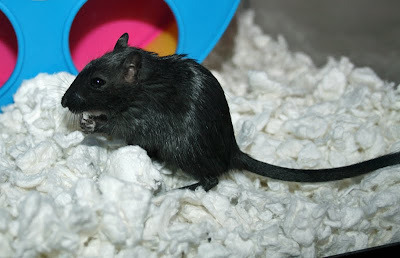 our mom says they bite... seemes all the small rodents dont like her so we will just keep an eye on yours? congrats on the new family members. Hello Bert and Ernie! Harley is probably happy to have a couple more dudes in the house. That's pretty cool you get real Gerbil TV! Cool you have gerbils! They are very cute. I LOVE these little guys already! Reminds me that I want a hamster so bad! WOWza MEOWza! In home entertainment! Wow, your family just grows and grows! 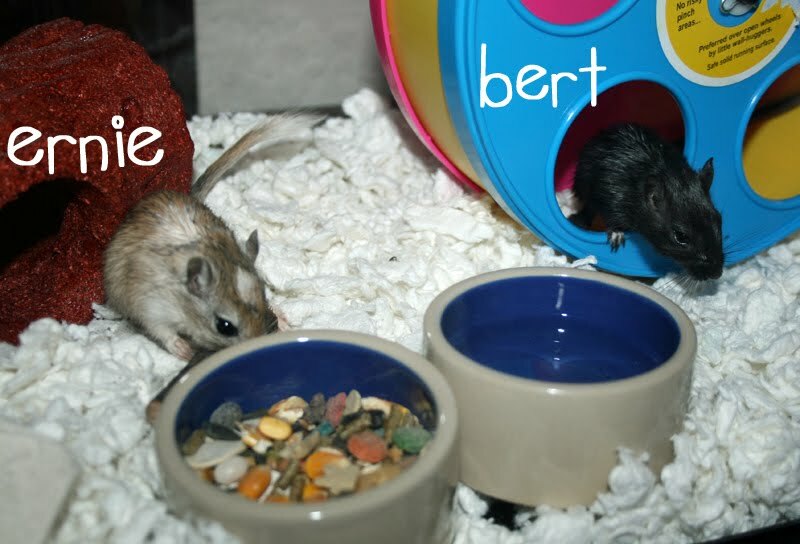 I love the names Bert and Ernie! Mousies!! We look forward to hearing from them in your Monday funnies. I love your new friends. Just be careful not to play too rough with them. Wow, do they ever look... uh... tasty! Yeah. Hm. You sure they're family members, Daisy, and not lunch? 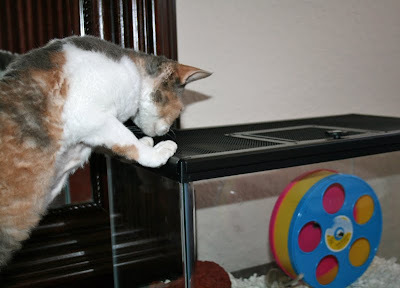 Maybe this explains why my human won't get any gerbils for us. They're very cute :) I bet you and Harley are having a lot of fun watching them! WOO HOO!!! Our Meowm guessed right! Little mousie type creatures! We bet you are going to have tons of fun with them. What made your Mom bring them h ome? Ooooo, noo toys... uh roommates! We don't have those in Hah-why-eee but Aunty Lynette used to have pet rats a long time ago. We only have Quincy but he's too big an skeery to play wiff. Momma sez he bites really hard too! Oooh, the publicist had gerbils when she was a girl. They were two male gerbils. She ended up with 17 gerbils. We think Bert and Ernie will provide you with hours and hours of entertainment! Now this is going a little bit too far! I know your Mommy likes to feed you raw meat, but live meat??? I'm just kidding. Bert and Ernie are very, very cute. I just hope they never get out accidentally -- or that you never get in. Can't wait to hear all the stories about them! OMG OMG OMG OMG *faints* wow wow wow dinner! just kidding, kinda. mommy had gerbils growing up. make sure they are both boys cause mommy's "were" and yet they were little breeding machines. then the mom ate the babies twice. wierd. she said they are adorable! We have guinea piggies and love them very much. Congrats on your new family members! They are super cute! We can not have no pets cuz we is enough pets! He sayed! T=Bert and Ernie will be lots of fun to watch! Bast! We wouldnt be able to stand it... Live mousies right in our HOUSE! We apologize cuz we know they is fambly, but OH GASP, we couldn't bear it! How exciting! You and Harley will have so much fun watching Bert and Ernie. Thoses look like mousies to me. Good to whap and chase around. Then put the big bitey on them. They are very cute. We likes Milo and Alfie Age 2's idea about the ball. That could be a safe way to interact! We hopes to see them in your comics some time! STAY IN SAFE Bert and Ernie!!!! Oh crumbs! The Kats will NEVER let this one go. I can see it now, one gerbil for each of them. Oh boy! I thinks we'z onto something here...congrats on the new mousies! How exciting! Daisy & Harley, you'z going to have LOTS of entertainment in the future. Way to go! Those look like really neat pets/toys. Little things like that are fun to play with if your mommie gets them an exercise ball. You can chase them, and they are still safe. We think you are very lucky to have two new pets/toys. Gerbils are cool! Our mom and her brother had gerbils when they were kids. My mom's gerbil was named Pepe, and her brother's gerbil was named Messy James. Pepe was friendly and liked to be held. Messy James was a biter. Hey I tfink those guyz are my cuzins! they almost match the colors of you and Harley, cool. ernies little gloves are cute. I hope you don't ever run out of kibble at your house and tfhink your new pets are food!!! they should keep you entertained wif all their runnings around in that glass house box. Uh ... no eating Bert or Ernie, 'K? Oops, we thought they were mice! They sure are cute! P.S. Panda Bear thinks they might be very tasty, in addition to being cute. do ya spend alot of tyme watchin them?? we kuldnt be trusted.